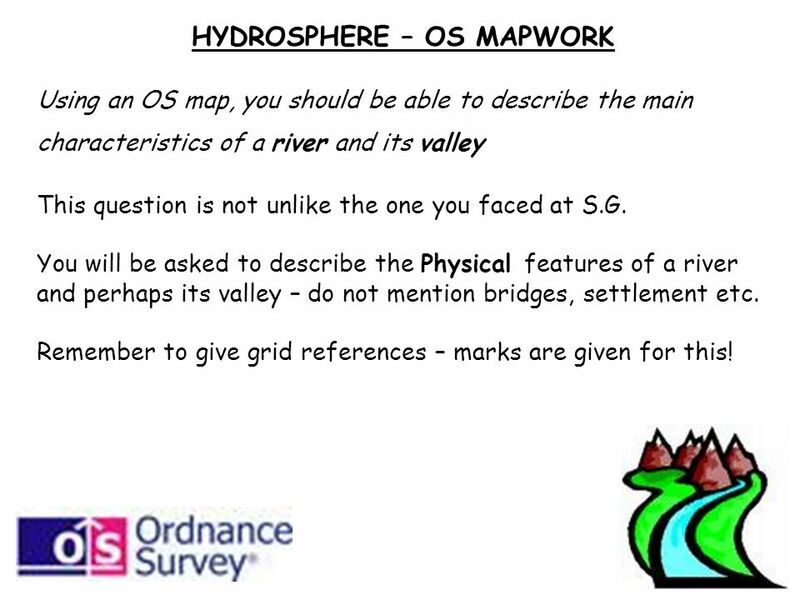 Using an OS map, you should be able to describe the main characteristics of a river and its valley This question is not unlike the one you faced at S.G. You will be asked to describe the Physical features of a river and perhaps its valley – do not mention bridges, settlement etc. 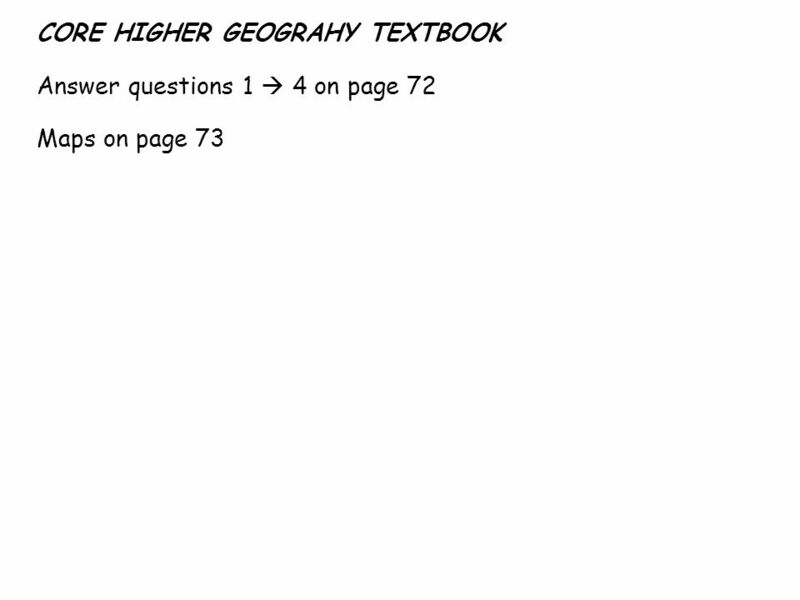 Remember to give grid references – marks are given for this! Strong answer: The river meanders to the NW. An example of a meander is found at The river is roughly the same width throughout the section and could be in its middle course. There are 2 tributaries with confluence points at and There is an ox-bow lake at There is an embankment at suggesting that the river is prone to flooding here. The valley has a flood plain which widens from 500m wide in the South to 2km wide in the North. The East side of the valley is gently sloping to over 30m whereas the West side is steep, rising to over 70m. What do you think of this answer? Can you draft up a list of questions you should be aiming to answer? Can you draft up a list of questions you should be aiming to answer? 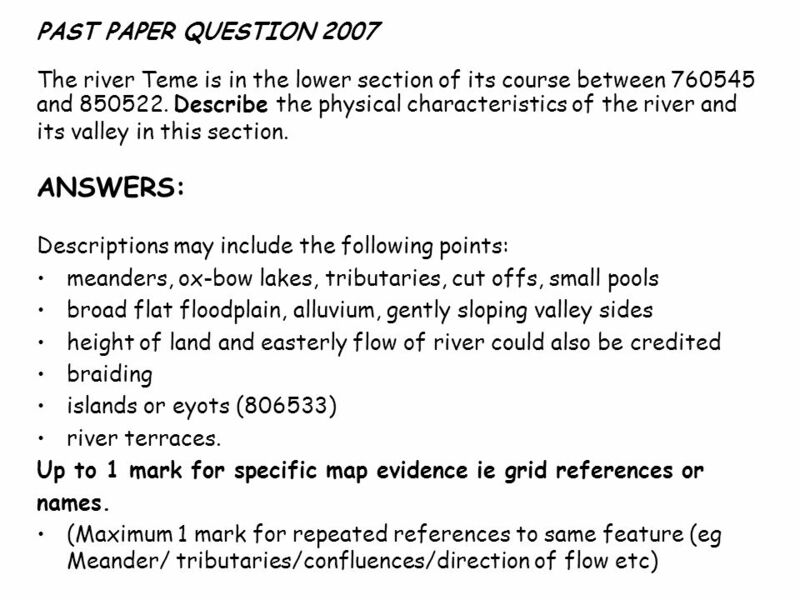 Physical Features of River: What course is the river in? STRAIGHT OR MEANDERING? DOES IT GET WIDER AS IT FLOWS DOWNSTREAM? DIRECTION OF FLOW? SPEED? GENTLE OR STEEP SLOPE? Features to note if present (give grid references) Braiding, embankments, oxbow lake, meanders, waterfalls Tributaries How many? From which direction do they come? 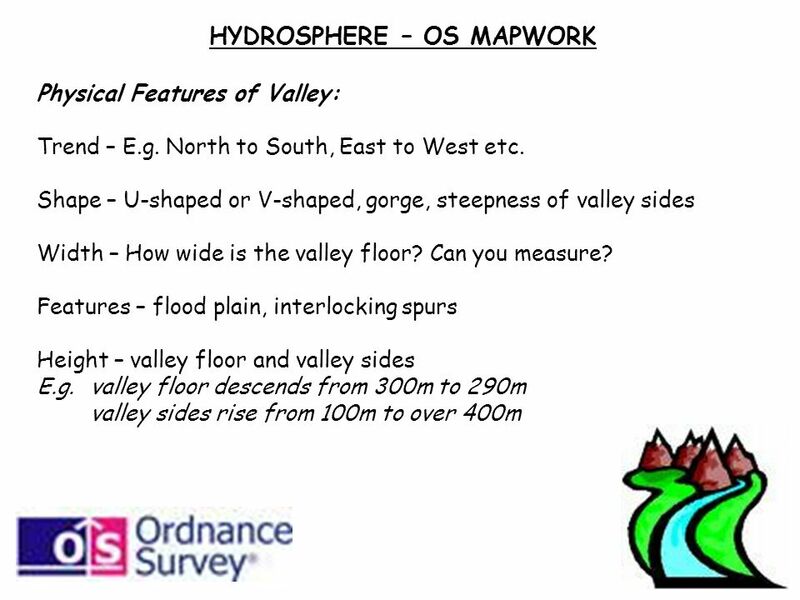 Download ppt "HYDROSPHERE – OS MAPWORK"
What are the following?. ??? 1.How might the following affect the rate of erosion… a.Gradient (angle of slope) b.Rock type c.Bedload (the amount of material. Source Waterfall Gorge Tributary Oxbow lake Meanders Deltas and estuaries. 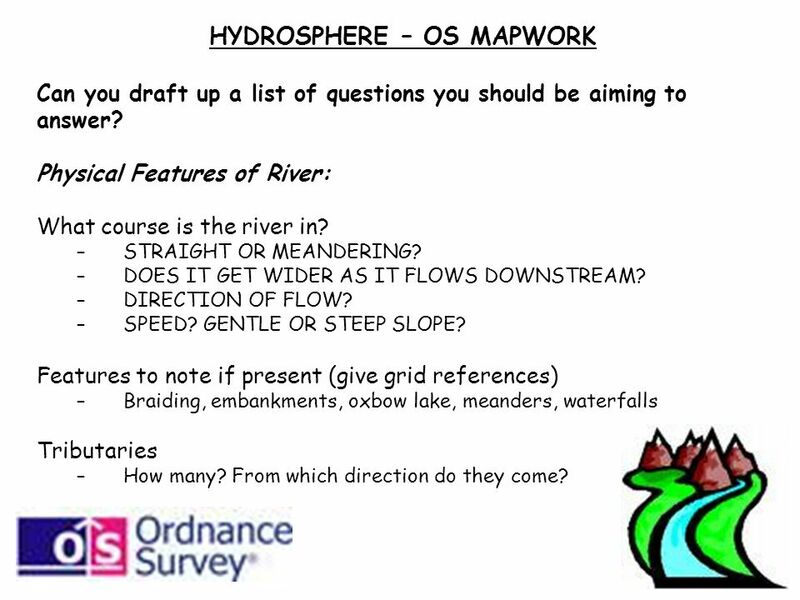 What landforms and features are associated with the lower course of a river? LO: To investigate the main features in the lower course of the river. This project and its actions were made possible due to co-financing by the European Fund for the Integration of Third-Country Nationals Rivers River features. 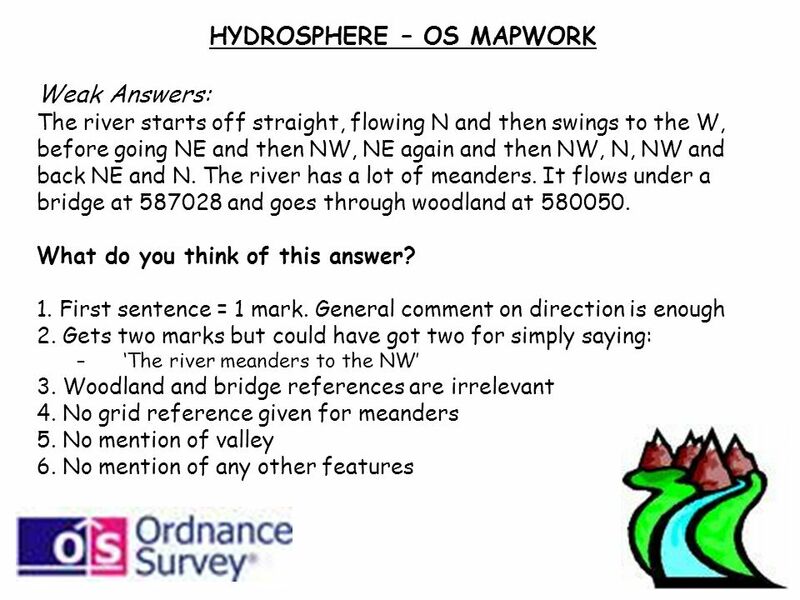 Geography Hydrosphere Rivers on OS Maps: Worked Example[Date] Today I will: - Practise answering past paper questions relating to rivers on OS maps The. September 2014 Lesson on: Different fluvial landforms Key term: 1.Fluvial 2.Fluvial landform Key question: 1.What are the different fluvial landforms? River Studies. Outline of Events During your river field work you will be visiting two different sites in the lower course of the river. At each site. The Physical World Revision Notes.